Like what I’ve said in my first entry, I’m no first-time blogger. Naturally, I would already have the hang of this in no time. Boy was I wrong. This time, blogging felt like some forgotten talent, a skill that has gone unused for quite some time (much like solving algebraic equations). As an appropriate 15th blog post, I would like to share the difficulties that I have faced in keeping Comm de Garçon up and running. When in doubt, stick to your guns. Like I’ve said, it’s hard talking about something that I have absolutely no knowledge about. This doesn’t mean that I’m uninformed about current events though. I just felt that I won’t be able to verbalize them to the best of my ability. It’s childish how I deal with my personal insecurities but then again I do not want to pretend that I know everything. I’d rather do a boring post about something that I am truly interested in (I’m pretty sure my peers are tired of seeing me write about fashion) rather than write a pretentious entry about a recent event just for the sake of doing timely social commentary. Typing the entry is only half the work. I’m pretty sure that a lot of people type their entries on some word processor and then copying and pasting it here on WordPress. That’s the easiest way of actually putting out a post. However, since part of opening your blog to the public means being able to engage them for more than five minutes or so (just enough to get them through an entry or two), putting supporting media is necessary. Formatting it to fit the post certainly feels like a chore that one would rather not do (like washing the dishes for instance). Adding content (photos, videos, etc.) that would grab their interest involves searching for that material, choosing the one with the best quality, and then uploading it to some external host website. This is precisely why each blog post would take me at least an hour to make. Thirty minutes if inspiration strikes. Proofread, proofread, proofread! I am a self-confessed grammar Nazi so you could just imagine my horror if I spot a grammatical error or a misspelled word in my entries. Sometimes things just sound better in my head or when I say them out loud. That being said, I tend to forget that translating something that is orally acceptable into a written piece of work requires much reviewing and rephrasing. My ideas don’t always come out as how I heard them in my thoughts which is why I’m apologizing right now for any “What the hell did he just say?” entries. Dig a little deeper and you just might find oil. Of course, I’m speaking metaphorically. I’ve learned that one must not take everything in its face value. There’s so many implications, so many subtexts behind every situation. With that, I really need to give more time in assessing all the events that happened during the duration of this semester. I know very well that I missed out on a lot of good potential entries but you know how writer’s block can be. Many of my peers have said that blogging can be a total drag unless you put your mind to it and I admit that with this blog, I didn’t exactly use up all my critical thinking capacity for it. Regardless, it was fun having to put my OrCom hat on and act like I know a thing or two about stuff. I still have a lot to learn and discover, and just because this is technically my last required entry doesn’t mean I’ll stop posting here. For now, I just need a little breather before I can write about anything again. Let me start by saying, I am no stranger to blogging. I have created two blogs in the last ten years and I must say, each is definitely reflective of my, dare I say, “persona” at the time. The first blog I ever made was very much ridden with angst and sometimes incomprehensible rambling. This should come as no surprise as it was made during my junior year in high school. Back in 2005, blogging was a relatively new trend that came to the Philippine shores. Almost everyone in my batch created one, particularly under Blogger.com’s platform because of the user-friendly interface as well as the option of having a customized look and feel to one’s blog. Lord knows how many times I scoured Blogskins.com trying to find a layout that was so uniquely “me,” something that virtually screams my name when you open my URL. Customization aside, the username was just as important as the things you put in the actual entries. My blog was appropriately named (for the 15-year-old me, at least) My F*cking Confessional. Even more so, it was spelled out in alternating caps (yes, proto-Jejenism at its finest). I just had to add the expletive to make it seem more “in your face” and more angst-y. Fast forward to late 2006, I grew tired of the seemingly bleak excuse for an online journal that was my blog. I decided that I needed to change my outlook. And change, I did. I created a new blog, but this time it portrayed a decidedly different. Whereas my previous incarnation was a lovesick yet forlorn “creature,” the new me was more upbeat. So upbeat in fact that I decided to ditch the whole my-blog-is-predominantly-black-because-I’m-miserable shtick and opted for dizzying bright gradients for my banner (I still kept the splatter motif though) which in turn reflected onto my blog entries. 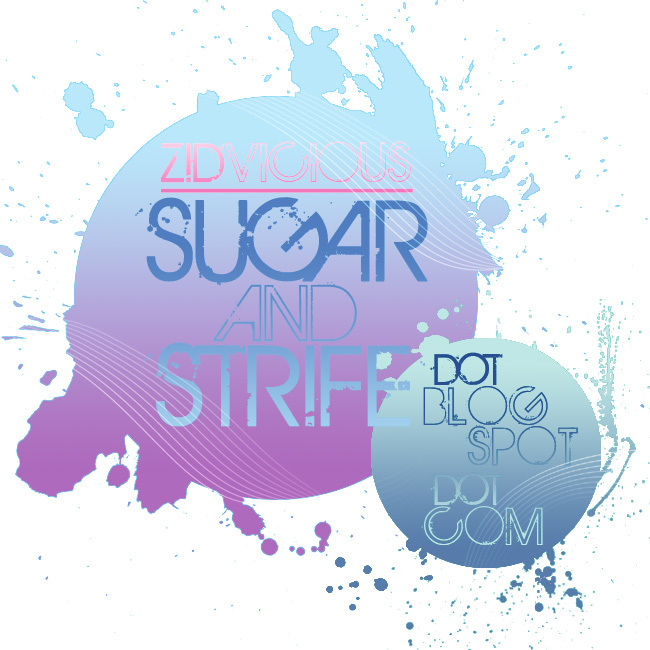 For one thing, I wrote like a psychotic 10-year-old girl in the midst of a sugar rush (hence the name, Sugar and Strife). There was, however, some glimmer of hope in my writing. Certain entries were very introspective but not in the shallow high school-ish manner that I had years ago. Sadly though, my blog only lasted for only two years. With this new WordPress blog though, I feel that I have really matured. Now it seems, my cynicism has ripened and my wit has become increasingly sharp. I intend on having a steady direction for this little project (figuratively and literally speaking). Gone are the gratuitous displays of self-indulgence. I will do my best to make each post as substantial and as insightful (but at the same time interesting) as possible. But of course, don’t expect me to be a blog prude though. I will have my share of overzealous blog posts but rest assured, it won’t be limited to just that. Let’s just say, I’m going to be more straightforward and more serious (gasp!) with my writing style. I just hope that I can keep this up as long as possible, meaning until I get graded for this. Just kidding, Sir Barry!